. :: Riders from Sharjah Equestrian & Racing Club win the titles for both Medium and Big Tour classes at the third round of The Gulf Elite Tour ::. On Thursday 14th and Friday 15th December 2017, at Al Habtoor Polo Resort & Club, Dubai, spectators and fans witnessed the festive themed third round of The Gulf Elite Tour. The Tour has now reached its mid-season point which has gained attention, applause and support from throughout The Gulf. Under the support and supervision of Emirates Equestrian Federation and sponsored by Longines, Mill Capital, Jumeirah, JLL (Jones Lang LaSalle) and Generosity Water, the Tour forms part of the Emirates Longines League. The Gulf Elite’s 6 event season aims to further promote and present Show Jumping and its competitors to a wider audience, with the ultimate objective being the preparation of the UAE and Gulf nation riders to compete and win on the International circuit. Show Jumping in the UAE now enters into its International Season which will see visiting competitors from over 20 countries and will play host to a number of the superstars and celebrities from the Equestrian community until March 2018. The Emirates Equestrian Federation was represented by Hossam Zemit, Ashraf Al-Leithi and judges Lisa Hareb, Khalil Ibrahim and Ahmed al Shamsi. Rider Mohammed Ghanim Al-Hajri on horse "Hermes Du Maribussa" of the Sharjah Equestrian & Racing Club won the Big Tour against 11 other participating riders, winning emphatically after a blistering jump off time of 43.58 seconds. 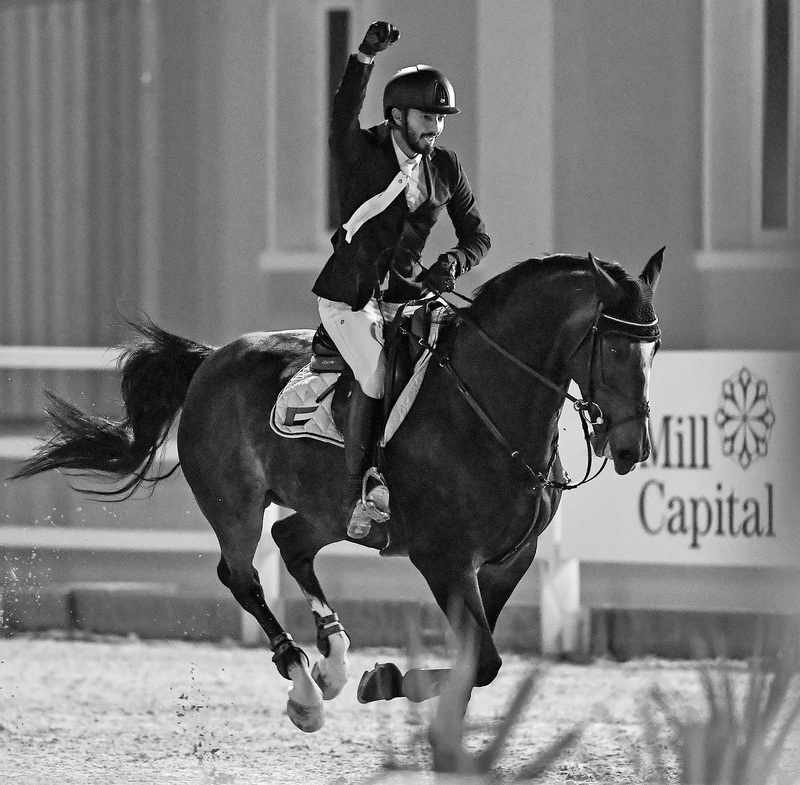 Rider, and Gulf Elite Tour Ambassador, Sheikh Ali Bin Jamal Al-Nuaimi, on-board "Celtic", also representing the Sharjah Equestrian and Racing Club, won the Medium Tour Class title defeating 31 participating riders, and a 13 strong jump off round. With only 5 going clear and with no faults, Al-Nuaimi galloped through the timing gate finish line with a round of 47.21 seconds. The course, designed by Yousef Al Mahmoudi, set the Medium Tour at (135 cm) and up to (145) cm in the jump off round. The Big Tour first round fences were set at (145 cm) and up to (150 cm) in the jump off round. The courses are designed at The Gulf Elite as much to prepare the riders for the International Season that is around the corner, as it is to get them used to competing in front of a Grand Stand audience, sponsors and a new fan base. 19 times Danish Champion, Tine Lund won the jump off round over the 125cm course, designed for young horses (5-6) years, on her six-year-old horse "beyond fellow dancing k" riding for the Dubai Polo & Equestrian Club, finishing in 39.64 seconds. Other winners also included of Shadi Gharib, on horse "Nahla" of Sharjah Equestrian and Racing Club and in the Juniors category, Rashed Yousef Al-Junaibi rode to victory on "Vilateen De Mottyer" of Emirates Heritage Club claiming victory in a time of 37.34 seconds. The third round was attended by VIP as the general Mohamed Saeed Al Merry, Sheikh Rashed Bin Ahmed Al Maktoum, and stars of film and music, business men and women and media icons, including artist Mariam Hussein, singer Nadia Al Mansouri, director Maher Al Khaja, artist Bilal Abdullah, singer Amal Mousa and other artists, social media bloggers and activists. The fourth round will be an FEI 2* international, with a total Prize Fund of AED 400,000 and will be held on the 25th, 26th and 27th of January 2018. Competition will be intensified as it will bring together some of the most important riders from all over the world including the UAE, Saudi Arabia, Egypt, USA, France, Italy, Sweden, Canada, Ukraine, and other Arab and Western countries.